Distance / 距離： maybe 10km? Kabrybek not only supplied dinner, but also a yummy breakfast of bread, jam, cream and tea (all home made of course – except for the tea). The cream was interesting – very viscous, kind of like a syrup. It went very well with the jam made from small black currrents from around the house. Kadrybek drew a basic map of where I needed to turn off the main road onto the ‘road’ that would take me across the Kerege-Tash pass to a road that connects to Eki-Naryn and then to the main town of the Narin Oblast – Naryn City. According to the owner of the Karakol Hostel, this route is not only great for cyclists, but also has magnificent scenery. What a load of rubbish! 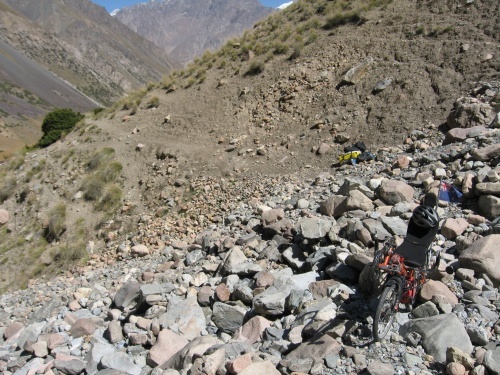 I don’t know what he was thinking, but how could anyone want to take a fully loaded bicycle over this terrain?! Yeah the scenery is OK, but it is totally and utterly unridable. On a light, unloaded mountain bike, sure. But for me on my loaded bike, it is kind of like falling into some sort of cyclists’ hell. 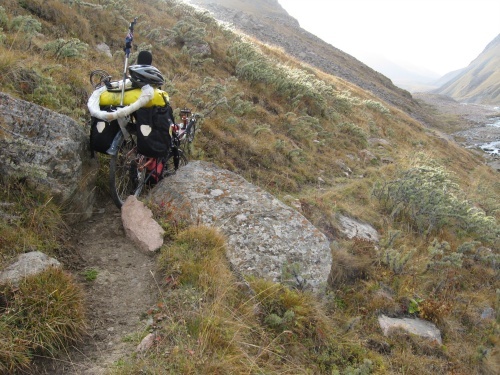 On one occassion, where the track was too steep and too rocky to push almost 50kg of bike and lugguage up it, I had to remove all the baggage from the bike, and ferry it and the bike over in three goes. What a mission. Is this really going to take even two days to Naryn? 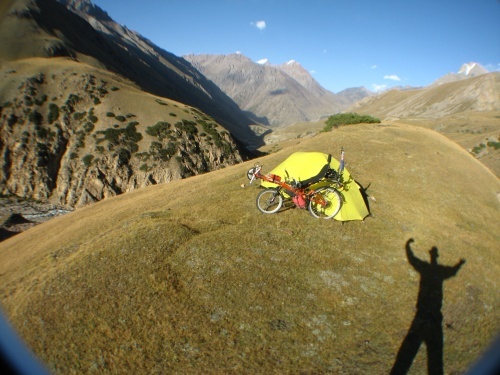 As I sit in my tent after trying to eat some more tacky pasta (I threw it out half way through), I figure I may as well continue, since I’ve come a fair way, and Kadyrbek and Valentine (Yak Tours Hostel in Karakol) are adamant that many cyclists have done this route in the past. I should be in Naryn in a couple of days. Who is Kadyrbek? Someone you've met before? May be I missed something but I don't think you've mentioned him before. Have been following your fabulous adventure for some time now and just enjoy reading about them, others comments,and viewing and reviewing your pictures.Telling others about your site and they all love it.